Sometimes great ideas arrive a little bit too late for their time. But sometimes that great idea can spark an actional step forward. 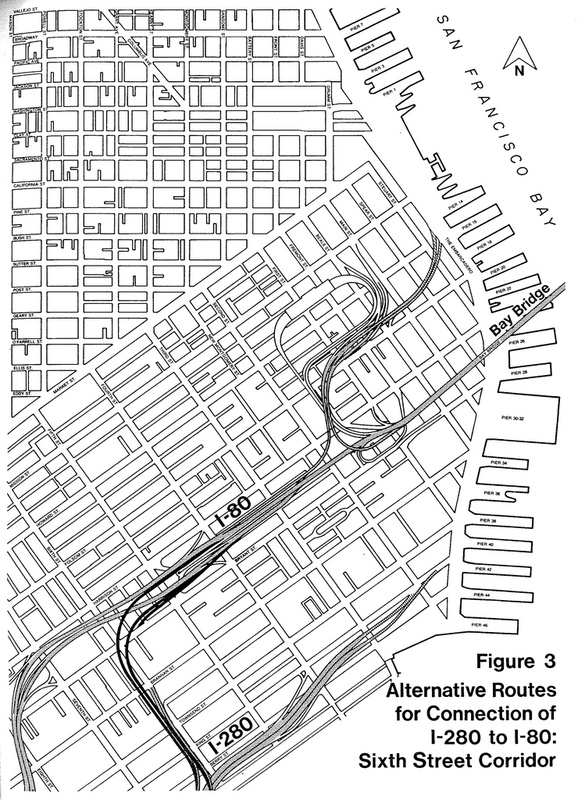 What if we built a new freeway linking I-280 to I-80 through SoMa, and then tore down I-80 further west to open up SoMa and reconnect it like it once was before the 1950s. Removing the great dividing line that is I-80 through SoMa could rekindle a neighborhood, but the devil is it would take dividing another part. Would it be worth it? Green parcels open up new land, while the orange lines show where a SoMa Link connects I-80 to I-280. Image: Screen cap from GavVerma drove video. The edge between what gets built and what is a curious unbuilt proposal is a thin line. 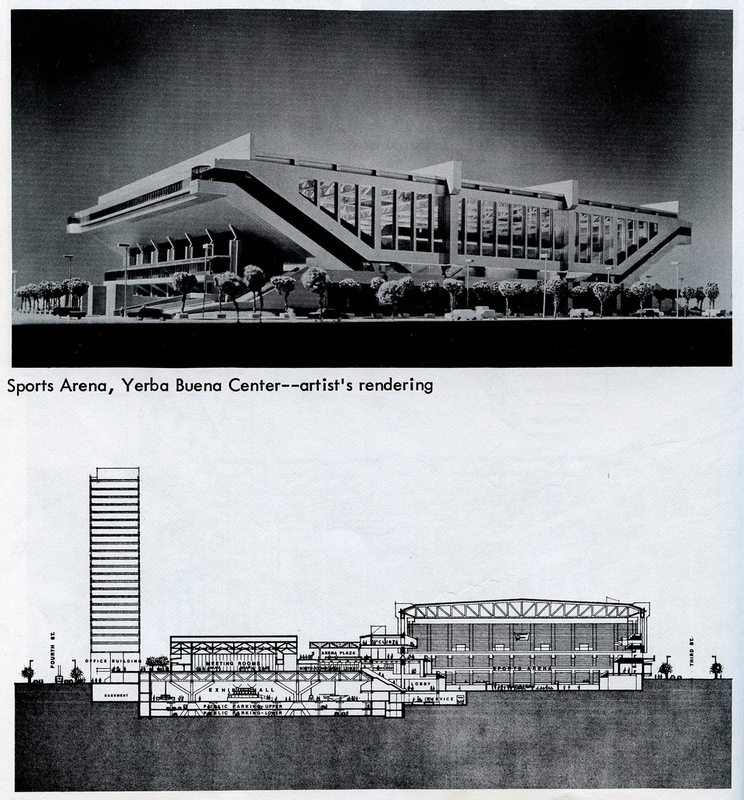 Moscone Center may have included an arena while the BART system may have never happened without narrowly passing with the 60% required vote. The future of Mission Bay's I-280, the Downtown Rail Extension (DTX), and the Fourth and King railyard are the focus of with Railyard Alternatives and I-280 Boulevard Study (RAB). 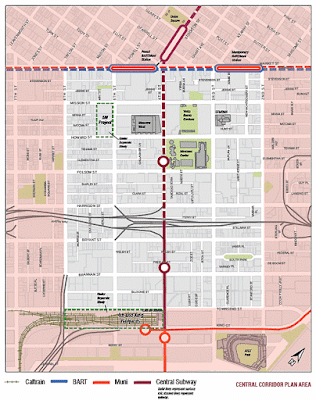 I've covered the DTX alignment alternatives before, and a bit about a future HSR railyard. However, I'd like to focus on the removal of freeways this time. The study, and several other folks have proposed removing the freeway north of 16th St, or even Cesar Chavez, which means taking down 0.85 miles or 2 miles of the freeway, and converting much of it into a boulevard. Much of the benefit of removing the freeway would be to connect the growing Mission Bay and Design District (Potrero Flats) neighborhoods with new street connections. But what if we might bet better off tearing down a different freeway, and keeping the I-280. Instead, what if two bigger neighborhoods were reconnected while maintaining freeway access from the Bay Bridge to points south in San Francisco and beyond into the Peninsula? Wouldn't a freeway removal that maintains regional connectivity, but also benefits more local residents, affecting a wider population, and with greater development potential be the better choice? Let's examine a proposal that may just do that. First I'll lay out the proposal, address the "that's crazy and stupid", and finally go into the great opportunities, obstacles, and benefits. Remove the 1950s section of I-80 between the Fifth Street exit/entrance to the Central Freeway. Maintain access between Highway 101 and I-80 and the Bay Bridge, by connecting I-280 to I-80 at Fifth Street. 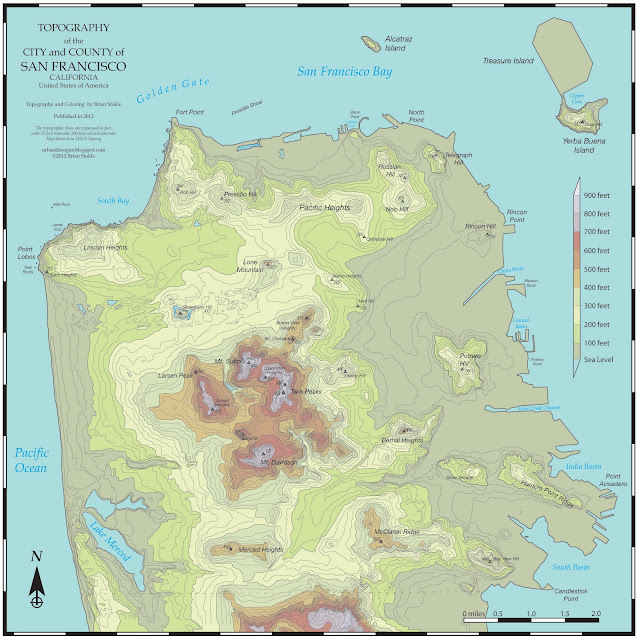 As shown in the map below, by removing 0.85 miles of I-80 in SoMa you would gain 27.5 acres of land. To achieve this, I-280 would be extended 0.40 miles from its current terminus at Sixth and Townsend to I-80 at Fifth and Bryant. A little over 7 acres of land would need to be acquired for the new freeway connection. Effectively the SoMa link would net a minimum 20 acres of land with only adding 2,100 feet of new freeway. Note, the connecting of I-280 to I-80 was proposed before back in the 1974. This alternative for connecting the two highways would have gone down Sixth Street in what appears to possibly be a double decker freeway. The SoMa Link proposal has many compelling elements, but let's look at some of its drawbacks and parse them out. There are several. Well yes, it does seem a bit wild to build new freeway to eliminate freeway. However there is precedent with the Central Freeway removal, which was torn down from Fell and Laguna all the way back to Van Ness and Division (0.65 miles), but was rebuilt for 0.35 miles to reach Market Street and enable Octavia Boulevard and Patricia's Green park. Similarly, Providence, RI tore down and relocated a portion of I-195 and opened up 20 acres to new downtown development. We'd be gaining in the big picture. 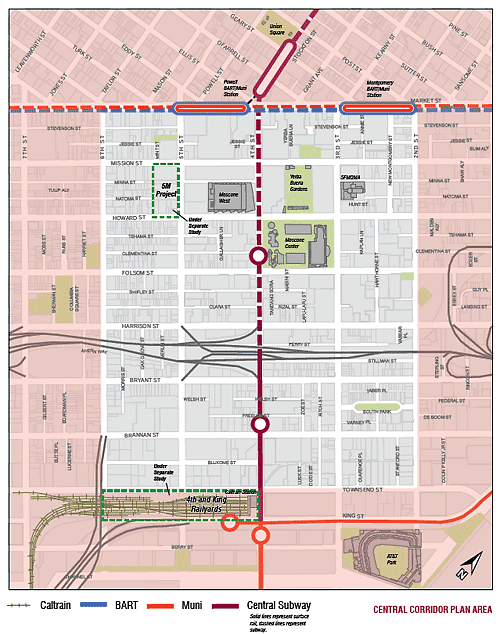 The SoMa Link would go through much of the upzoned area of the Central SoMa Plan being put together by the San Francisco Planning Department. Much of this land is already very valuable with access to Caltrain and the future Central Subway, in addition to proposed height and density increases. The Central SoMa Plan is important as it provides more office space near transit. Building the SoMa Link through this area would reduce the potential of this land; not just from parcels in the freeway path, but also for the negative physical, and perceived effects of a new freeway passing through the neighborhood. However, the new land opened up from eliminating I-80 would greatly increase the value and development potential in its path. 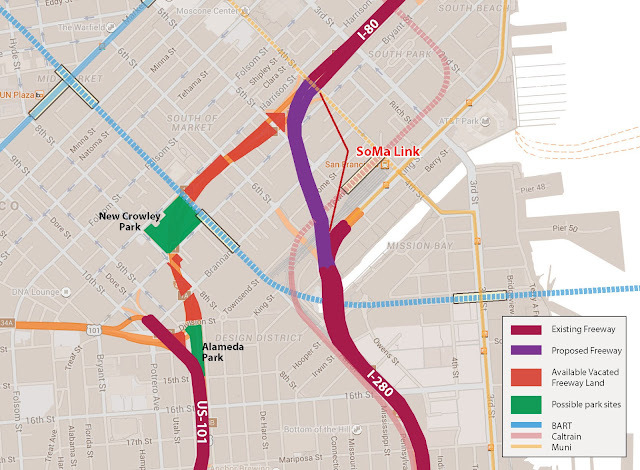 The Railyard Study is currently considering pulling I-280 back to 16th Street or Mariposa Street, which would essentially eliminate the chance for a SoMa Link. I believe that the ball is rolling, and that I-280 has a good chance of being moved back. As such the SoMa Link idea has a low chance of happening, which is ok. However, if the Railyard Study, the City and Caltrans believe that tearing down I-280 is not needed, then we should at least examine the pros and cons of the SoMa Link Freeway. Much of the land under I-280 is undevelopable, or would be narrow plots that have less potential than the I-80 parcels. 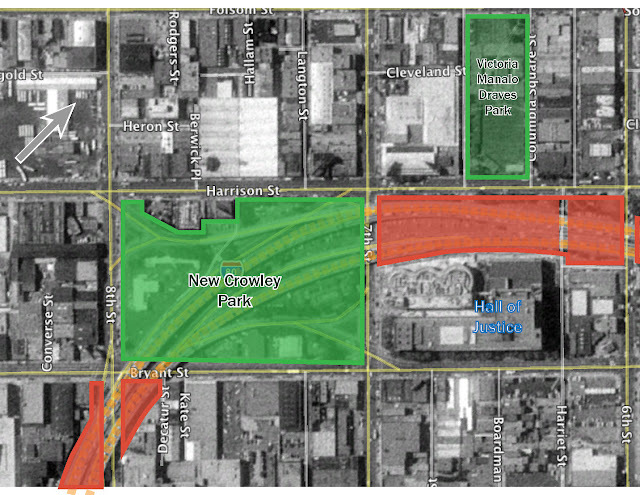 Much of the right of way the I-280 boulevard land would be converted to a boulevard to connect with King St and 7th St. Only about 9 acres of land would be developable, and is largely made up of narrow parcels. Current I-80 works, doesn't it? Although I-80 and US-101 (originally built as the James Lick Skyway or Bayshore Freeway) seem to work with a mix of 3 and 4 lanes in each direction, they force so many lane changes that their capacity is less than it would seem. Heading north, from Cesar Chavez, there is only one lane, lane two from the center, that goes all the way through to the Bay Bridge. When the highway reaches the Bay Bridge it is only three lanes wide. Less problematic is westbound I-80 and southbound US-101. Lanes 2, 3, and 4 from the Bay Bridge all reach Cesar Chavez, but have many 4th lanes as on an off ramps. The I-280 freeway has fewer lane count changes and required lane changes for through traffic. If I-280 remains, and we have a major turndown in our economy that holds off development in Central SoMa, then we should at least examine the SoMa Link idea, and how it might help the city, its citizens and neighborhoods more than pulling back I-280. I have not included the benefits of redeveloping the Fourth and King Railyard as it is a mostly separate issue, and involves questions of where train storage, and the DTX alignment. The I-280 removal includes 0.4 acres of possible developable land in the railyard. In terms or street connections, the SoMa Link plan would create better street connections through bridge removals on 9 major streets and 4 alleys, while adding 4 new freeway street crossings and 2 alley street crossings on the SoMa Link I-280. In contrast removing I-280 to Mariposa, would remove freeway bridges at 4 streets, with the chance of adding two small streets. New Parkland - Returning park land. SoMa, the Design District, and Mission Bay are all growing areas for work and for living. New developments at X(Mission Bay), Y(Design District), and Z (SoMa) are just a few examples. People in these areas need parks for relaxing, playing sports, or exercising. South Beach Park and Brannan Street Wharf are to the east along the Embarcadero. Although important, they are far from much of the new development. 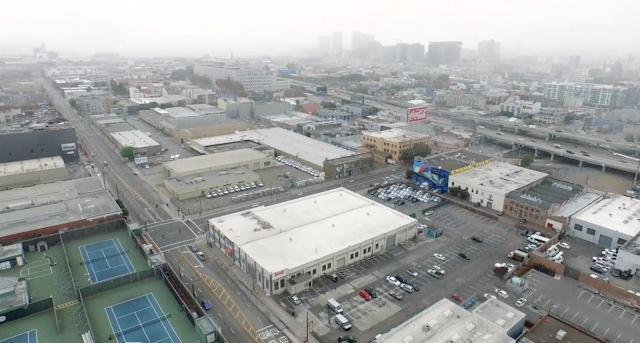 In fact SoMa had one large park that was removed. 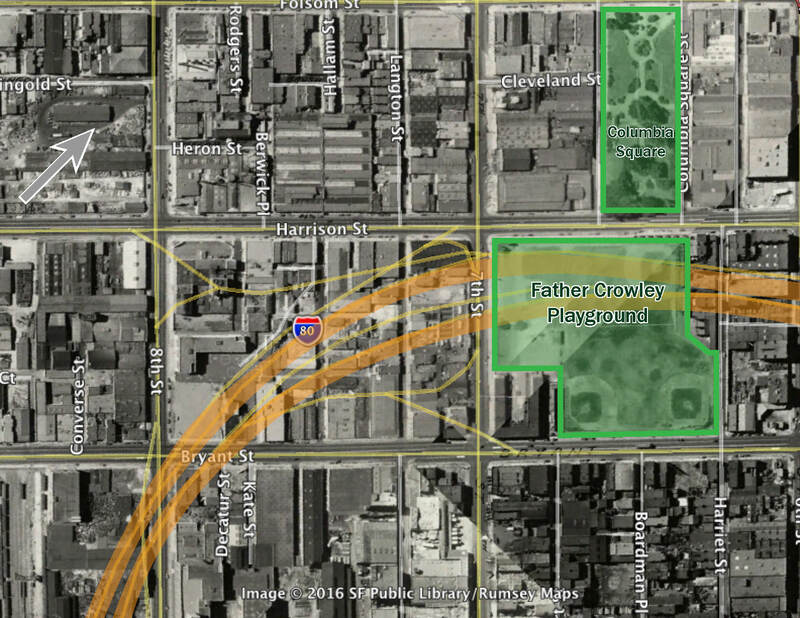 Father Crowley Playground (originally Southside Playground) was once an active ballfield green measuring about 6.5 acres in size located at Seventh Street between Harrison and Bryant. The park was removed when the Bayshore freeway was created, in addition to the Hall of Justice. A replacement for the park was never made. The SoMa Link proposal would open up so much land to help replace the removal of parkland and add more. Two major parks could be added - one bounded by 7th, Harrison, 8th and Bryant, which would be 9 acres, or just over half the size of Dolores Park. More critically, the park would be flat. Another park I'm calling Alameda Park, could added between Division and 15th St. With a size of 3.35 acres, it would be larger than Washington Square Park. All this development would be great for housing and jobs, but does it really have the access that the Central SoMa plan that the Central Subway offers. Currently this area is accessed by several buses, but not Muni Metro or regional rail. 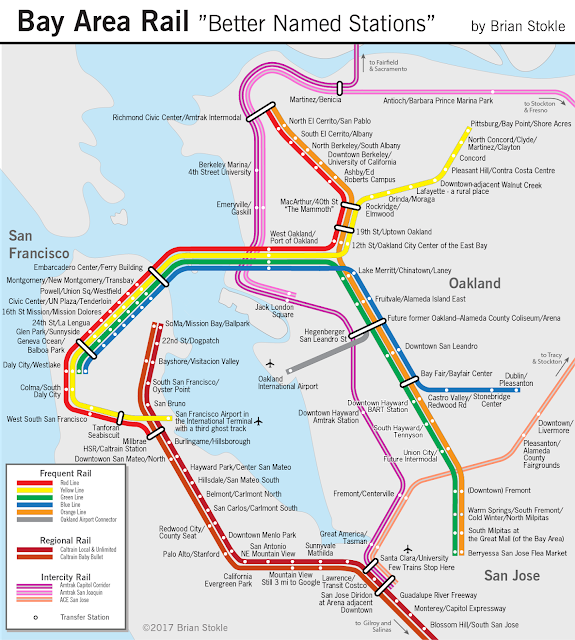 However, with talk of a second transbay rail crossing, a 7th Street BART line connecting Oakland to Mission Bay, the 7th Street corridor in SoMa, and on to Civic Center BART station, this area would gain just the access necessary to justify denser development. Although other rail alignments are being considered, it shouldn't be ignored that combining a new rail line in this area with the removal of a freeway would create a very energized neighborhood - possibly with more potential than the Central Corridor area. I heard about this idea from a friend and found it intriguing. As many know from reading my blog, I look at things with a very long perspective, but also with a practical perspective. Like I mentioned earlier, the SoMa Link proposal is a fascinating idea, that seems a little bit too late to the game of grand planning in San Francisco. If it were proposed in a serious way back in 1999, it may have had a better chance of being seriously considered. However, with the Railyard Study (RAB), the Central SoMa Plan, and San Francisco's dislike for building new freeways, the idea would seem to be dead on arrival. More of a curiosity of "what if?" I accept this. But you never know - if the RAB doesn't call for pulling back 280, and developments don't start building up in SoMa, then it could have a chance. You don't get many chances for eliminating an old freeway, uniting an neighborhood, and still keeping the freeway traffic moving. Possible location of a new SoMa Park. Why not name it New Crowley Park in honor of Father Crowley. If the SoMa Link plan were actually studied, it could bring great new development to the true center of SoMa and adjacent to the Design District (aka Showplace Square). A New Crowley Park, and an Alameda Park would truly bring great benefits to their surrounding neighborhoods. Further along in time, the Central Freeway could be removed, and later on even Highway 101 between Division and Cesar Chavez. Much developable land exists on and adjacent to these areas. Reconnecting SoMa with the Mission, and Potrero Hill with the Mission would be a great benefit to these communities currently divided by freeways. Although I-280 could be removed back in the same way, half of the freeway passes through the industrial warehouse portion of the Bayview, and has less developable land due to being double deck in parts, and over the Caltrain tracks in other parts. I'll leave on a little story. Way back in 2001, when I was researching a report about the Central Freeway and the already planned and authorized Octavia Boulevard, a friend of mine wanted to tear down the entire Central Freeway back to the I-80/Hwy 101 interchange. He said we should talk to the designer of the boulevard for some advice and insight. I told him the designer was Alan Jacobs, the former Planning Director of San Francisco, and then professor at UC Berkeley. He said, "Let's call him." I said, "We'll never get to talk to him. Why would he talk to us, and he'll never pick up the phone or call us back anyway." My friend insisted. We called Allan Jacobs. He picked up the phone. We had a conversation about the boulevard, the Central Freeway and the possibility of tearing down the entire freeway and replacing it with a boulevard. "However great the idea of pulling back the freeway may be, be careful of what you wish for. By calling for altering the already agreed upon plan of a boulevard between Market & Fell, but keeping the freeway further south, you may be jeopardizing the entire project. If you stop the wheels of moving the current plan for an altered plan, you cannot guarantee that altered plan may come to be." Jacobs continued, "A case in point was the Hall of Justice and the James Lick Skyway. When these two were being planned in the 1950s, the plan called for passing through the site of Father Crowley Playground. At the time, according to Jacobs, the public was told that although a park would be eliminated, a replacement park would be built somewhere. The freeway and Hall were built. To this day no replacement park has been built." So be wary of what you wish for, unintended consequences may be worse than an original victory. But also seek out the art of the possible and the great ideas and results that can come from it. All ideas expressed in this article are all my own opinions and thoughts. No ideas expressed are in any way necessarily those of my employers, collaborators or colleagues - Brian Stokle. It's an interesting idea - but tweak it to build on (rather than fight) the 280 tear-down proposal... there's amble room at 5th Street to take 80 underground; so make your Soma connector an *underground* 80, running from just east of 5th Street, turning south to somewhere between 16th Street and 20th Street (b/w Potrero Hill and Mission Bay). The mayor et al. get their quiet above-ground boulevard and connectivity, while the freeway system remains unified, connected and functional. Note that your idea would also allow 280 and 380 to be re-signed as 80, all the way to the current 380/280 interchange - taking 80 west virtually to the Pacific. While I appreciate provocative thinking, I don't see the value in this. We currently have one mainline through-freeway (80/101) and one really long stub-end freeway ramp (280). You just are proposing flipping them to make 101 the long stub-end and make 80/280 the mainline. Seems like a ridiculous amount of money and eminent domain taking current transit-served land to end up in essentially the same position we are now, yet a net loss by taking a bunch of that transit-served developable land next to the $2b subway we're building and giving it over to a freeway. Waste! Dumb growth! That just shifts the burden of growth further west into western SomA far from existing/planned transit. I like provocative thinking, but focusing on removing 280 is the way to go - it's a net win/move forward, not a reshuffling of the existing chairs. It ties the whole east side of the city together. And by the way, tearing down 280 also makes space for more/bigger parks. The Mission Creek park could be significantly expanded into a real waterfront park that is not overshadowed by a freeway. And you could dedicate a chunk of the railyard to open space as well. But none of that is possible/desirable with leaving 280 up or extending it further. 1. I don't think you're being ambitious enough. Why not tear down the 101 all the way to the 101/280 interchange? 1. If this idea were to occur, why not tear back the 101 all the way to the 101/280 interchange. While this idea may handle traffic well, it may not be too popular with SF residents in SoMa to build another freeway, especially when there are already plans to possibly remove the freeway north of Mission Street. I always thought that moving that section I-80 underground and building one large central park on top of it (similar to I-93 in Boston, or the Big Dig) would be a good idea, but extending I-280 to the West Bay Bridge approach would just leave another elevated freeway running through SF. Also, I think that knocking the Central Freeway all the way back to I-80 would just create too much traffic, but maybe just pushing it back to Folsom Street and reconstructing the freeway east of Folsom would be a great idea. I have seen proposals from other people about knocking the Central Freeway back all the way to I-80 but that would just create traffic. One proposal didn't even have an interchange for the new boulevard, which would just cram the current off/on ramps on I-80. And even if new traditional off/on ramps were constructed at the new boulevard, they would not flow traffic as smoothly as the current stack interchange. That's why I think it would be better to reconstruct the interchange but favor the through traffic, especially traffic approaching the Central Freeway northbound on the 101 to I-80 instead of the Central Freeway. 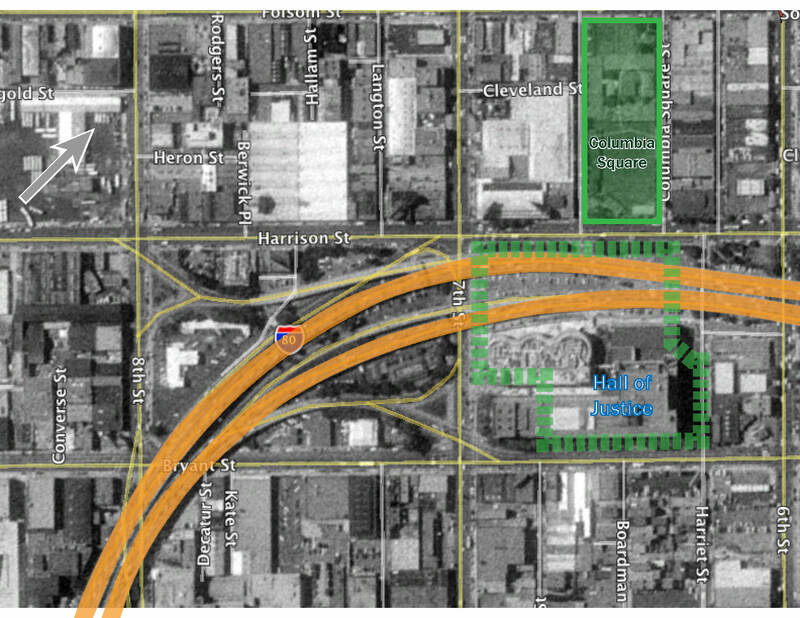 Then the section of the Central Freeway between I-80 and Folsom Street would be reconstructed as a six-lane elevated freeway with an off/on ramps at Harrison Street and an auxiliary lane between the I-80/101 westbound connector and the Harrison Street off-ramp. The freeway would have overpasses at Portero Avenue, Bryant Street, and Harrison Street before coming to a signalized intersection at Folsom Street. 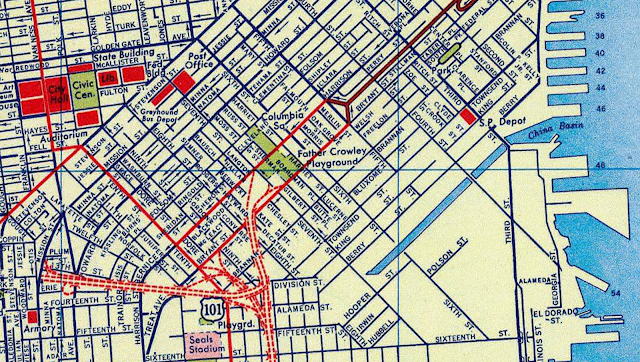 The rest of the Central Freeway would be removed and be replaced with boulevards. I would propose the new boulevard to be called Central Artery Boulevard because it distributes traffic to several different SF neighborhoods. (Yes, I know the former elevated I-93 in Boston was dubbed the Central Artery, but has since been torn down, so the name is officially back up for grabs.) The boulevard would be six lanes with three lanes in each direction until it splits with and extended Octavia Boulevard and then the right lane would be forced to turn on Octavia , the center lane may go straight or turn right, and the left lane must go straight. After that, the existing Dubcoe Avenue would be improved to a 4-lane boulevard with 2 lanes in each direction to Market Street. Also, I believe that Central Artery Boulevard should not include too many turn restrictions and only use them where needed. I believe I am not the only person annoyed with all the unnecessary turn restrictions in SF.